French artist Edgar Degas was part of the impressionist movement in the 19th century and now his works are among the most instantly recognisable in the world. Degas was born in 1834 in Paris and studied at the Ecole des Beaux-Arts. He produced both paintings and sculptures and much of his work is based on ballet dancers. His ability as an artist was recognised early in his life. When he was 18, he was given permission to go to the Louvre to ‘copy’ some of the works on display there. This was a training technique used by artists at the time – they honed their skills by copying paintings by the masters. He studied the works of Raphael and Delacroix. He only studied at the Ecole des Beaux-Arts for a year before leaving to spend several years in Italy, studying and painting. He returned to Paris in 1859 and was determined to be recognised as a painter. He worked on large historical scenes and some were displayed at the ‘Salon’ where works of art were judged on their form. These works were not well-received. 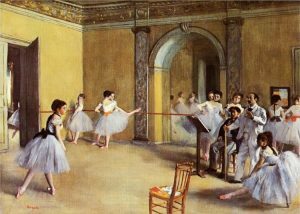 It was in 1862 that Degas became friends with Edouard Manet. The two of them were keen to throw off the rigid rules of the establishment and move to a more modern approach to art. Within the next few years the two were joined by other artists including Monet, Renoir and Sisley, meeting regularly at the Café Guerbois and all were keen to make an impact in the art world. Together they formed an art society and put on their own exhibitions. They were dubbed the Impressionists, although Degas preferred his work to be referred to as ‘realist’. Their first exhibition was held in 1874. Further exhibitions were held over the next few years, making these painters some of the most prominent in the world. Degas never married and died in the city of his birth in 1917.